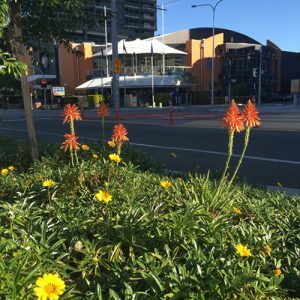 Historically in Australia pure aloe species have been used by Australian gardeners as fleshy leafed plants, suitable as pot plants or for tough conditions where nothing else grows. 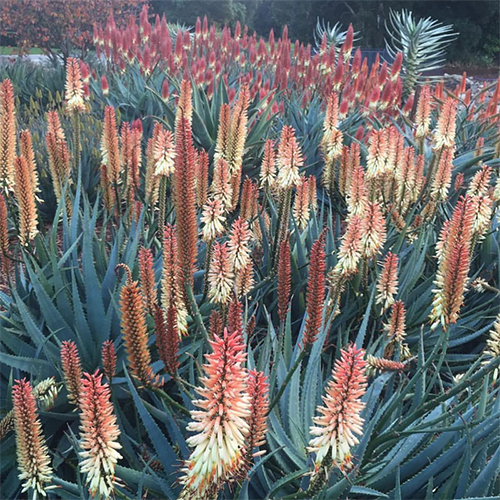 It is only more recently with increased availability of a wider range of flowering Aloe-Aloe's that landscape architects, garden designers, landscapers and home gardeners have started using them as flowering perennials for the garden. 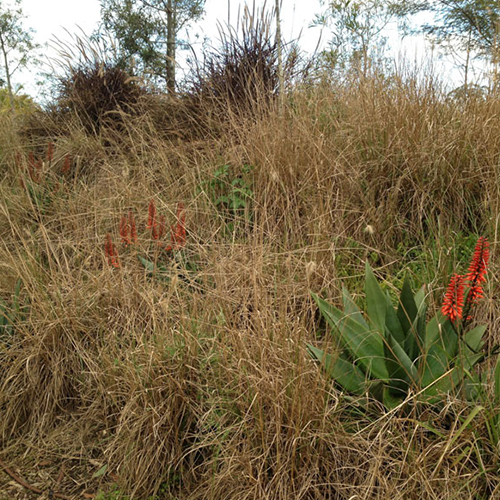 Design with aloes is not difficult but understanding the different cultivars and planning is important. On TV programs mature gardens are magically created in an instant but the real theatre of a garden takes many years as plants grow and evolve over time- This needs to be properly understood. Your own garden can be viewed as a work of art that’s highly personal but most importantly it is dynamic, it changes with the seasons and its users are thousands of creatures, not just you. However landscaping is both an art and science as it combines your skill for observing what already exists which you need to work with (Mother Nature) with your talent for designing and creating enhancements. In the past many generations of Australian gardeners have fought Mother Nature, rather than working with her. Many of us with ancestors originating from European mild climates have tried to pretend that we still live in those climates and wasteful fight mother nature with introduced water so as to try and keep the less robust plants we have historically used alive, rather than working with mother nature and use plants like Aloe-Aloe’s which cope with our harsh climate of flooding rains and drought. The scarcity and price of water is an increasingly relevant consideration in garden design. 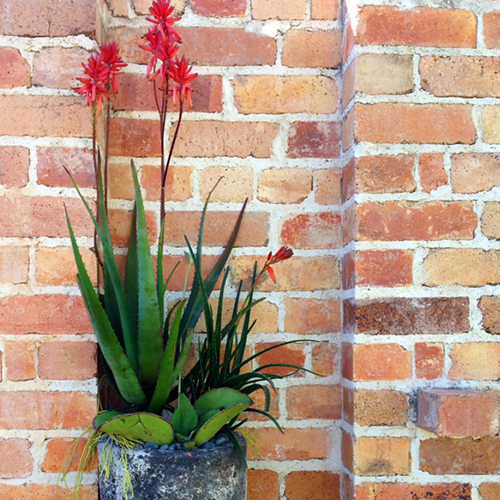 Aloe-Aloes require little care and can tolerate long periods of very dry conditions. Lets not think gardens are all about design- whilst its important part of the process, gardening is the most important part- observing, interacting, experimenting, and learning. Too many of us get a professional to “landscape” our gardens, as it is a piece of furniture that will stay that way forever. It is important to understand the conditions of the garden as each garden has a different microclimate, different terrains and slopes and receive different amounts of sun at different times of the day. Generally garden centres across the country stock younger cheaper plants and it is important that in designing a garden with aloes the mature size and form of the aloe is understood rather than the little young plant in a pot. (See “Plant this- get this” images on each individual plant cultivar page). Understand the goals and users of your garden and remember that contrary to what many believe, Aloe-Aloe cultivars are not dangerous plants. Most have insignificant margins on the leaves but whilst some of the larger cultivars do have a bigger margin which can scratch, it is soft and unlikely to pierce ones skin like the thorn of a rose, or needle of a lemon tree. 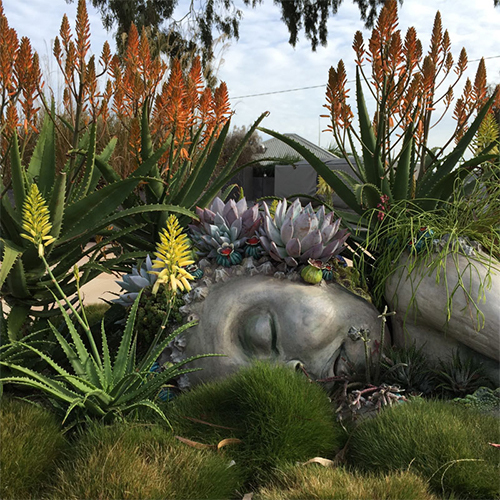 With the rise in popularity of “succulents’ and gardens of a “Californian” or “santé Fe” style, many Aloe-Aloes are being used in this way. Whilst Aloe-Aloe’s contain fleshy leaves and are classified by some as “succulents”, aloes are effectively lilies from Africa and are not related in any way to cactus or agaves from the Americas. So whilst they are capable of being used in this way, it is important that they not be restricted to this use as they are capable of use in many other garden styles such as cottage gardens. It is important that the elements of your garden be understood. Existing structures and trees, soils, sunlight, temperature, drainage and other elements all need to be considered. Adding texture and form to the garden can be hardscaping or softscaping with other companion plants. Understanding the basic principles of color in garden design will help you transform the picture in your mind into a beautiful landscape. Color sets the tone-It can be soothing and subtle to exciting and riotous. Aloe-Aloe flower colours comprise orange, pink, red, white, yellow and also many bicolours. Aloe-Aloe hybrids flower generally very slowly, thus providing a show for an extended period of time. Aloe-Aloe’s make great landscaping plants because they have an enormous variety in shapes and sizes, rendering them useful in many applications. This also allows for planting tall growers at the back of borders/walls, in the middle of beds as focal plants and even as edging plants to beds. Leaf colours range from grey, green, yellow-green, dark green to red-green, and many with spots and speckles. In addition the texture varies greatly between cultivars, which range from very rounded, smooth leaves to leaves that are strikingly curled. Further leaves can have a smooth leaf margin whilst others have blood-red, black or white margins. Remember that in gardening with Aloe-Aloes the decision points on cultivar selection are not only around size, shape and flower colour but also timing of the flowering. 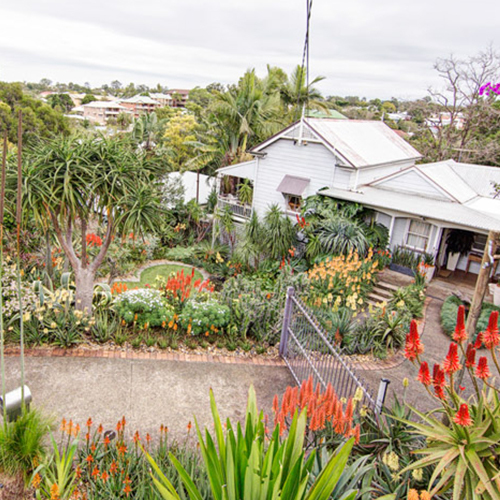 More and more gardeners are looking to simplify their gardens and select plants that require less water and maintenance, yet still put on an eye-catching display. 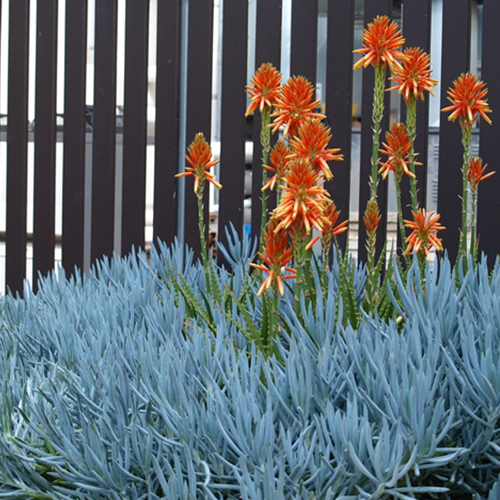 Aloe-Aloe's do just that – not only are they fashionable and striking feature plants, they are great en-masse. Aloe-Aloe’s do best with bright sunlight, so necessary to enable the good flowering they are bred for and capable of. This is more important for the larger growing cultivars although there are certain smaller cultivars like Mountain Gem™, which need a lot of direct sunlight in order to flower. The sunlight is best if direct but if only filtered sunlight is available it would need to be at least for half a day for flowering. Whilst it is possible to grow aloes indoors, and is done by many on account of the current succulent craze, the plant will never thrive. It will ultimately elongate, will weaken, will be susceptible to disease and will never flower. When aloes have been kept it the shade it is important that they be acclimatized as significant changes in light intensity can stress the plant and damage the leaves. This damage will ultimately grow out as new leaves form in the rosette. Aloe-Aloe’s can tolerate poor soils with the exception of clayey soils, which do not drain well. An open soil allows water to pass through the root catchment area, which means that the Aloe-Aloe can absorb only what water (and nutrients) it needs. Drainage can also be achieved from planting on a slope or a raised bed so that surplus rainwater is able to run off. If the garden contains clayey soils, river sand should be added as well as organic compost. We also recommend using well-rotted cow manure as mulch around the aloe. It may be necessary to build up a mound of sandy soil above the normal soil level if the soil is extremely clayey. In colder climates the aloe species from warmer climates may rot under damp conditions, not necessarily because of the excess water, but due to the lack of heat. 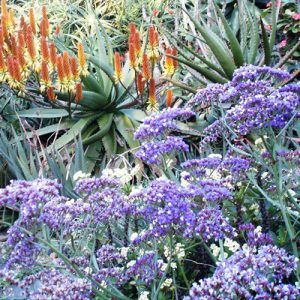 There are many pure species of aloes from warmer regions' of Africa that are unable to cope with frost we experience in the colder parts of Australia. However all of the Aloe-Aloe range are born and bred at altitude in South Africa where light morning frosts and temperatures of minus 5 degrees in winter is a common occurrence. For this reason all the varieties have been tested to be able to cope with light frost and most varieties with moderate frosts. As a general rule, the smaller the plant, the greater the likelihood of frost damage. 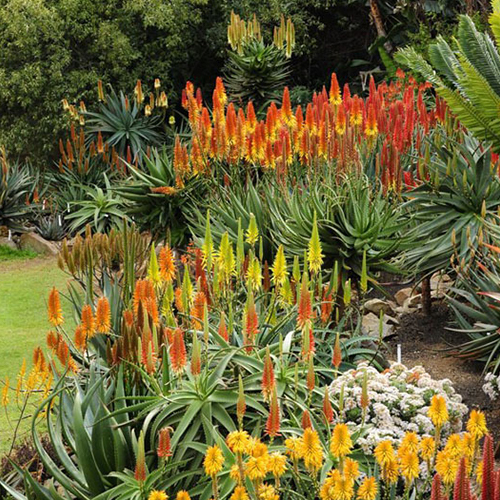 Aloes can last for months and even a year out the ground. 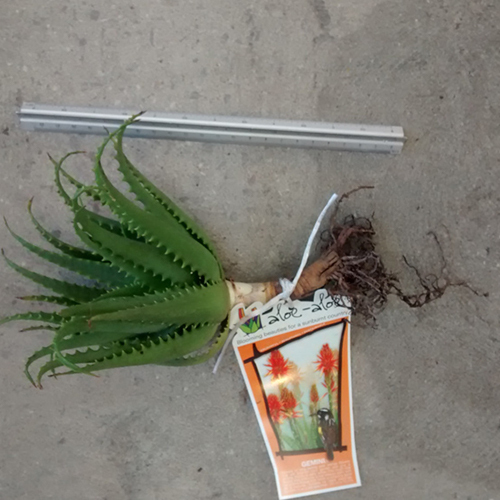 If acquired ex-ground it is better to let damaged roots dry out before planting the aloe hybrids. The hole to be dug should be at least four times the size of the root ball. Newly planted Aloe-Aloe’s need regular watering for a few months until such time as they are well established and the soil has settled. For plants planted out from pots this would be for approximately 4 weeks so as to ensure that the soil does not dry out completely. For bare rooted plants an initial watering, to settle the soil, is needed. There is a waiting period of about four weeks before any watering takes place. The same regime can then be followed as for plants from pots. 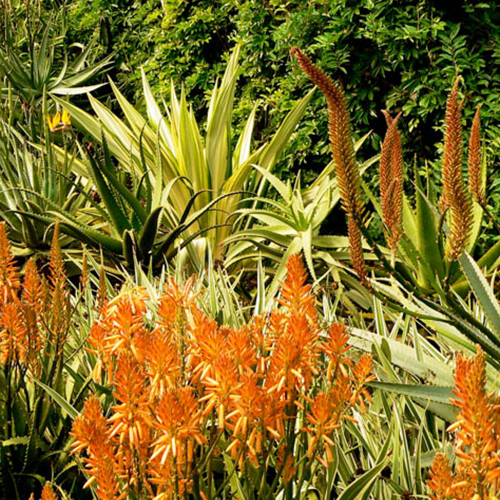 Aloe-Aloes in the garden do not require expensive irrigation systems. If you wish to install an irrigation system, ensure that sprinkler nozzles are adjustable and movable and that watering times can be manually controlled. ‘Out of control’ weeds are a constant concern of gardeners and landscapers and can add a significant cost to commercial maintenance. One approach is to introduce a layer of mulch on the surface which suppresses the weeds but has other benefits like keeping in the water, improve soil retention, reduces soil temperatures in summer and increasing them in winter. With Aloe-Aloe’s care should be taken as applying mulch too thickly as it can adversely prevent rainwater from flowing through to the aloe roots. Whilst organic mulches (like bark or leaf litter) will break down and ultimately form compost from which the aloes will feed, a rock or pebble mulch will allow water to pass through to the plants roots. Pebble can look striking in a contemporary landscape, but it can create a harsh environment that dominates and may not be suitable for softer landscaping styles. It is important that mulch is not pushed up against the stem of an aloe as this could lead to rot. Another option is to plant with high density so as to create a canopy which will reduce the likelihood of weeds. 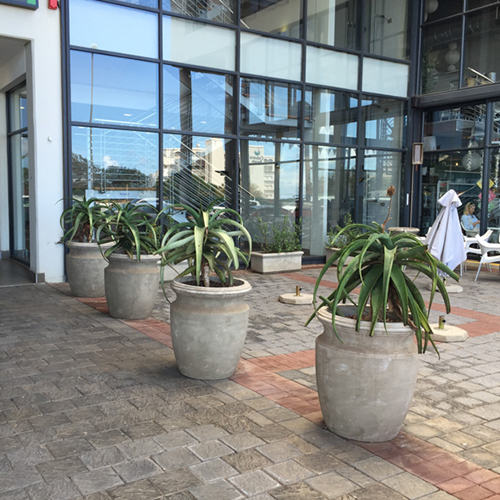 This planting can be done with aloes or by using other companion plants. Airflow is essential to aid aloe growth. Stagnant air pockets from planting too close together are to be avoided as this increases the risk of fungal growth. In Africa many commercial plantings of aloe are made (particularly along roadways) on the basis that these plants will compete with ‘weeds’ of the local area. They are often seen towering above weeds and grasses and are not adversely affected unless those weeds are creepers or plants like Lantana that will smother the aloe. Whilst a monoculture of just aloes can look good, Aloe-Aloe’s look great when planted in the garden with other plants, particularly with contrasting textures and forms. 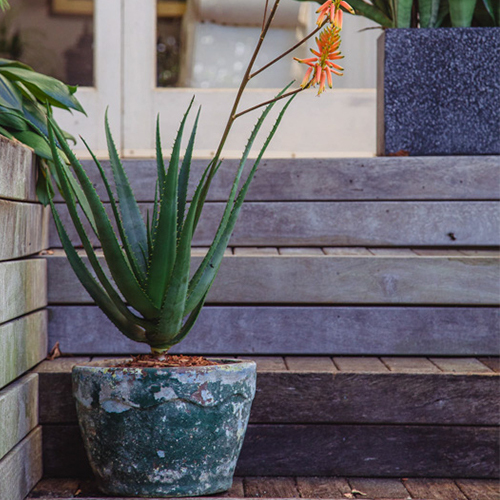 However it is important to be aware of the companion plants’ rate of growth and ultimate size, as it is bad for Aloe-Aloe’s to be overgrown or overshadowed. Also it is important to try to combine plants that require the same amount of water at the same time of year. Most Aloe-Aloe’s can be grown successfully in pots and containers but the ultimate mature size of the plant needs to be considered. Whilst it is possible that a large growing Aloe-Aloe (like Tangerine Tree™) can be started in a pot, eventually it will be too top heavy with its large rosette relative to the pot size and will fall over. It can be moving it to open soil when it outgrows its container. A well-drained good quality potting mix (with sand included) should be used. The pot should be given as much sun as possible. 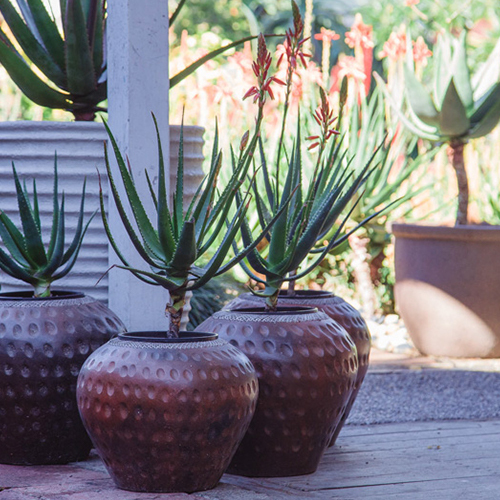 Aloes in pots generally require much more water than those in the ground but as with many potted plants, over watering is always a bigger problem than too little water. As a general guideline an Aloe-Aloe can be allowed to grow to twice the size of the container before it needs to be given more space.